Jeremy Lin at UBC’s War Memorial Gym. Photo by David Tsui. NBA player Jeremy Lin made a couple of high profile public appearances before he heads back to the east coast later this week. 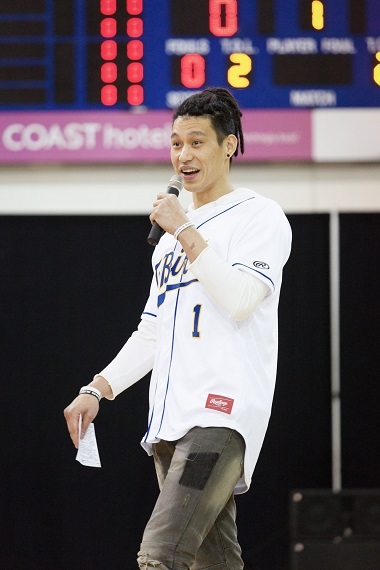 The Brooklyn Nets guard oversaw a basketball skills competition, gave his testimony and responded to questions before a sold out crowd of 2,700 fans at UBC’s War Memorial Gym April 1. Organizers decided to change the venue from Britannia Secondary School, which holds about 1,500 people, to War Memorial Gym at UBC because interest was so great. Lin gave an invitation to accept Christ and urged those attending to go deeper spiritually with Youth Alpha and Athletes in Action. UBC president Santa Ono attended the event and participated in the skills competition. Ono is an active Christian who preached at Tenth Church and spoke at the BC Leadership Prayer Breakfast last year. Go here for several videos of the event on the Athletes in Action Facebook page. I wrote more about Lin and the event a couple of weeks ago, here. 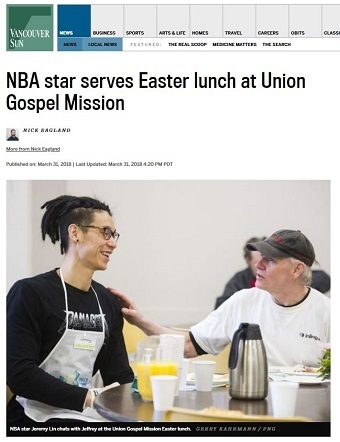 Jeremy Lin, a Brooklyn Nets point guard who has been rehabilitating from knee surgery this season at Fortius Sport & Health in Burnaby, surprised UGM by visiting its Hastings Street headquarters. A devout Christian, Lin is known for his charity work, including his own non-profit foundation which supports youth and children. 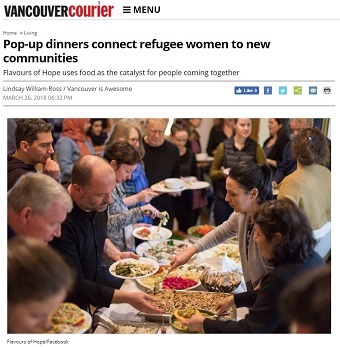 The premise of Flavours of Hope is to offer refugee women who are passionate about food an opportunity to cook for members of their new community. At the dinners, guests sit down and experience not only a taste of food prepared by the skilled hands of the refugee women in the kitchen, but also a taste of tremendous hospitality. The dinners are about dialogue – not just in the sharing of stories by the resilient women doing the cooking, but also as the evening opens up the opportunity for guests to articulate their own stories. . . .
Ling also has been organizing monthly dinners for her church community, and due to its proximity to the ISSofBC [Immigrant Services Society of BC] Welcome Centre, those new arrivals to Vancouver are often drawn to the events. For the full story go here. There was also a story in the Straight April 2. The next meal is a Syrian Fest at Kitsilano Neighbourhoood House April 7; it is sold out, but she is working on others. Trixie Ling also works as community connections coordinator for First Christian Reformed Church of Vancouver (which includes overseeing Community Night meals every Wednesday) and is on the board of Citizens for Public Justice. Two Alliance churches are offering a unique service to their surrounding communities. 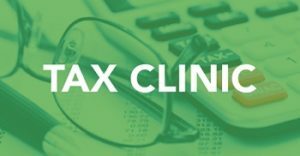 This confidential service is part of the Community Volunteer Income Tax Program – a partnership between the Canada Revenue Agency and community organizations that provide free tax clinics to low-income people and families. 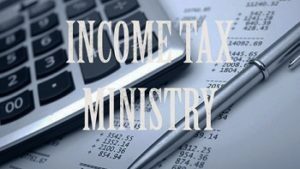 Free tax help is offered to individuals with a modest income and a simple tax situation. . . .
Mark Sakamoto knows what it takes to write and live a comeback story. His memoir, Forgiveness, charts his family’s journey to recover from dark episodes in Canada’s history. 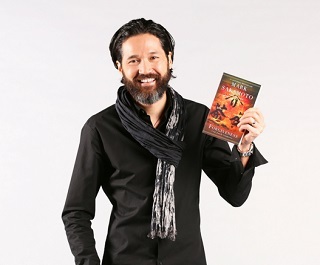 It chronicles his Japanese Canadian grandmother’s internment and his maternal grandfather’s time as a prisoner of war in Japan during the Second World War. “What a resurgence! It’s been wonderful to tell my story and my grandparent’s story all over again. I published the book in 2014 and went out and did radio hits – then you go and live your life. So having a second kick at the can and being part of Canada Reads is an honour. As the author shares his grandparents’ stories, he highlights ironic parallels between their lives. Each was taken prisoner. Each worked as a slave labourer. Each survived horrific physical conditions, humiliation and unbridled hatred. Each was at the mercy of men in power, distant from the tragic consequences that their decisions inflicted on ordinary people. And, most important – and miraculously – each learned to forgive. Ralph’s story of forgiveness is particularly moving. A few days before the war ended, American planes dropped aid barrels into the camp where Ralph was imprisoned. When he opened a barrel, he discovered a Gideon Bible, and felt that “it was as if it had been packed just for him.” Ralph was no stranger to the Bible and its teachings – his Christian mother had taught her children about God’s ways. Go here for an interview with Sakamoto and several other links. The Rally for Supportive Housing in Richmond planned for Monday, April 9, has been postponed due to city council changing the date on which the housing issue will be considered. For background, read Coalition supports modular housing for homeless in Richmond.